Ohh how I love fall, it's filled with beautiful colors and tasty smells. It's one of my favorite times of year because I can get lots of tasty treats then that aren't available other times of the year. I'm one of those people that loves anything with the name "pumpkin spice" on it. It's such a tasty flavor combination. 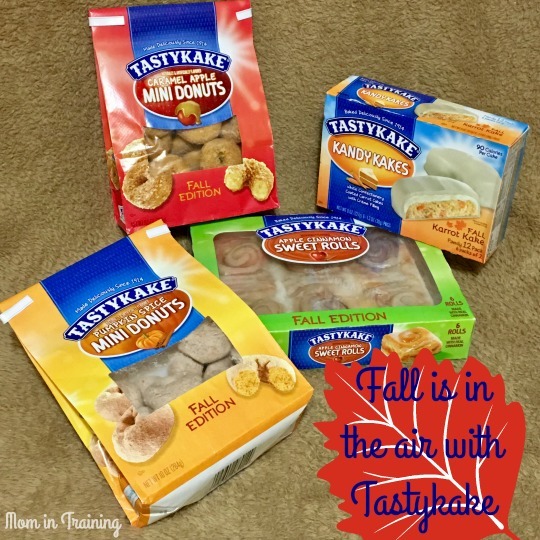 Take for instance the fall edition mini donuts from Tastykake. They have them in pumpkin spice and caramel apple, two fun fall flavors. I thought I would just try one as a snack and had to stop myself after the..well, after a few more than I had planned to try. Let's just leave it at that and say they were darn tasty. Here's the line-up for the Fall Edition - available for a limited time only! Tastykake's Karrot Kake Kandy Kakes supply tasty twists on the proprietary Kandy Kake treats with two autumn-inspired cakes to welcome the changing season. The Salted Caramel Kandy Kakes feature a chocolate coated cake with salted caramel filling, and the new Karrot Kake Kandy Kakes feature a white coated carrot cake with a creme filling. Tastykake's Apple Cinnamon Sweet Rolls taste like you just took them out of the oven. The moist dough is coated with apple cinnamon and covered in a sweet and flakey frosting.